A long-awaited audit of Metro Nashville Public Schools finds many of the wilder allegations of purchasing irregularities under Director of Schools Dr. Shawn Joseph's administration are "unsubstantiated." NASHVILLE, Tenn. — A long-awaited audit of Metro Nashville Public Schools finds many of the wilder allegations of purchasing irregularities under Director of Schools Dr. Shawn Joseph's administration are "unsubstantiated." Buried in the report from Metro's Office of Internal Audit are multiple criticisms of Metro Schools for not following federal, state and local purchasing laws. 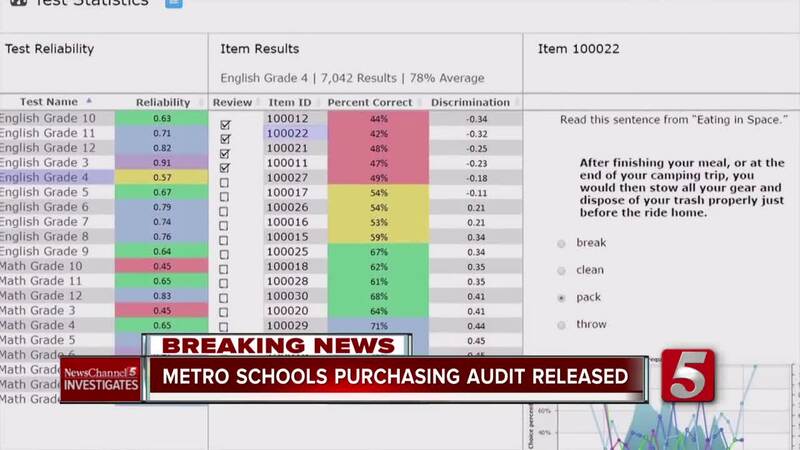 However, the audit appears to give the district a pass on a $1 million, no-bid contract that Metro Schools itself admitted this week was illegal, following an exclusive NewsChannel 5 investigation. Auditors agree that piggybacking that Performance Matters contract for student assessment software on an out-of-state contract, to avoid competitive bidding, would not have been proper. But they argue that state law does not require competitive bidding for consultants. MNPS had a different story in response to our investigation. “On Wednesday, Jan. 30, 2019, Metro Legal advised that while acting in good faith, MNPS purchasing staff made an error in interpreting state law that governs the use of out-of-state jurisdictions’ contracts to secure competitive rates on products," the district said in a written statement. Internal emails show that Metro Schools' own staff believed that the computer contract was a service, not a consulting arrangement, that would have been subject to requirements for competitive bidding. State law specifically says that contracts for "information management services, including, but not limited to, computer program analyst services shall ... be procured through a request for proposals process." The audit also confirms the findings of a NewsChannel 5 investigation that the school board approved contracts with Performance Matters totaling $1.1 million, then Joseph's team issued them for $1.8 million. "However, this error does NOT appear to have been intentional," the audit says. By contrast, Joseph told the school board in June 2018 that it was intentional. He claimed that former purchasing director Gary Appenfelder intentionally negotiated larger contracts, hoping to get a better price, without telling his superiors. The district was not able to produce any evidence to back up those claims. The audit also misses the fact that Joseph's team misled the board by claiming there had not been time for competitive bidding of a contract with Performance Matters for professional development software. And it is silent on the fact that other school systems got lower prices for the same service by using a competitive bidding process. In another area, the audit says it could not substantiate an allegation that Joseph's team "was preparing to execute a contract with Scholastic as a result of accepting a trip to a 2017 conference on Amelia Island, paid by Scholastic." Yet, the report also acknowledges that "the administration discussed placing a potential $1 million amendment to the existing contract with Scholastic on March 28, 2017, Metropolitan Nashville Public Schools Board of Public Education meeting agenda." Scholastic had billed the district for hotel rooms, but that bill was never paid until 13 months later following questions by NewsChannel 5 Investigates. Vice chair Jill Speering told Joseph's team that "she would not approve such a large contract since the Amelia Island trip had just been in the news," the audit report says. As a result, the amendment was never brought to the board floor. "The discussion of a potential $1 million Scholastic contract without sealed bids and competitive proposal shortly after the Amelia Island can create an appearance of a conflict of interest for some citizens when viewed with the 13-month delay in payment for the hotel expenses," auditors wrote. In the case of consultant Bruce Taylor, the audit said it could not substantiate allegations that he "is not qualified and lacks credentials or qualifications" for a $105,000 consulting contract. As NewsChannel 5 Investigates previously reported, Taylor's contract says he "analyzes student test results and recommends specific academic areas for intervention in order to improve ACT test results." The audit notes Taylor "has an extensive background in arts education" and "has written books on implementing the common core standards." However, it does not address the fact that his educational background is in theatre management, not education. In Taylor’s case, the audit says, because federal funds were used, the district should have utilized a competitive process. Instead, Joseph’s team gave Taylor a no-bid contract. The audit fails to address concerns that Taylor received contracts totaling $105,000, but those deals were never submitted to the school board. MNPS rules required board approval for expenditures of $100,000 or more. In the case of a $180,000 emergency contract with Edgenuity to provide online teachers, the audit says claims about it failing to comply with MNPS procurement procedures are "unsubstantiated." "However, there was no form to document how the decision was made" - which, the audit adds, was required under MNPS procurement procedures. Regarding the consulting firm Research for Better Teaching, the audit says there was no evidence that Joseph's team split up deals with the company to avoid the $100,000 threshold for board approval. Yet, the audit report says that Joseph's team did draft a contract with Performance Matters that - contrary to board rules - was never finalized or presented to the school board. Instead, as NewsChannel 5 Investigates previously reported, the administration began spending taxpayer money without a written contract. MNPS rules require written contracts for all expenditures of $25,000 or more. So far, according to the audit, the district has paid $172,161 to RBT. "There was more than one scope of work for Research for Better Teaching," the report says. "One scope of work was less than $100,000. If that scope of work had been drafted into a contract before the work was performed, the contract would not have been subject to Metropolitan Nashville Board of Public Education approval. "The other scope was initially more than $100,000 per the 'agreements' with Research for Better Teaching, but the amount paid was reduced. If the full amount had been drafted into a contract before the work was performed, the contract would have been subject to board approval." You can read the full audit report here .